The battle of Wednesday and Thursday drama series is not over yet. 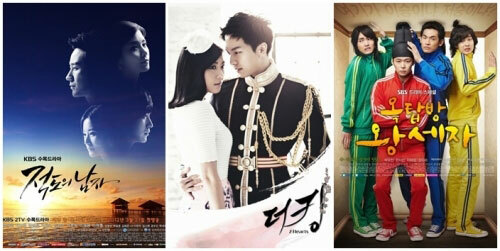 MBC’s The King 2 Hearts is still ranking at top, but the threat of SBS’ Rooftop Prince and KBS2’s Man From the Equator which are not to overlooked. According to AGB Nielsen Media Research agency, The King 2 Hearts broadcast on March 28th, 2012, recorded the rating of 14.5, decreased by 2% from 16.5% achieved on the broadcast on March 22nd, 2012. Although it has the highest ratings among all dramas that are broadcast at the same time, but according to the change on ratings, The King 2 Hearts was the only drama that experienced a drop in ratings on the day. The Rooftop Prince and The Equator Man are constantly in hot pursuit of The King 2 Hearts. Rooftop Prince debuted with the rating of 9.8%, which increased to 10.5% in episode 2 and 11.2% in episode 3. The gap with The King 2 Hearts is now only 3.3%. KBS 2TV’s Man From the Equator achieved the rating of 8.1% on the day, although it’s the lowest ratings, but it has been get rave reviews, the possibility for its ratings to rise cannot be ignored. On the other hand, on the day’s The King 2 Hearts, Lee Seung Gi and Ha Ji Won experienced a bomb explosion crisis, drawing their relationship closer. And the envious look of Lee Seung Gei when seeing Ha Ji Won has favorable impression on others is increasing the curiosity of audience on their future relationship development.